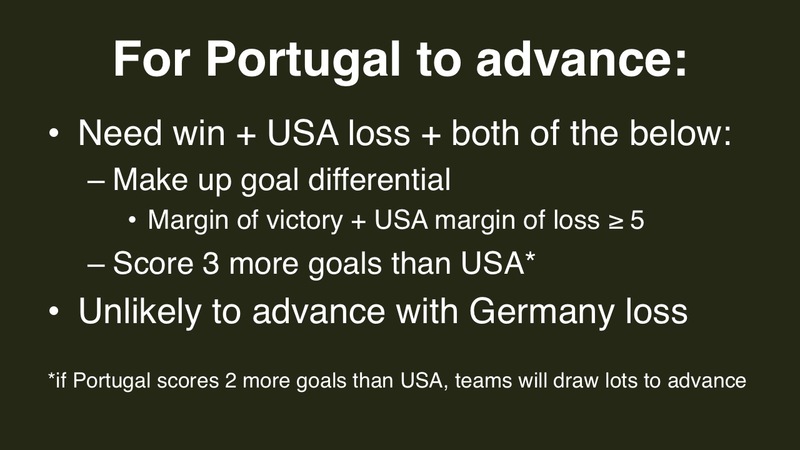 Update: here are 92 ways for the USA to advance against Belgium. 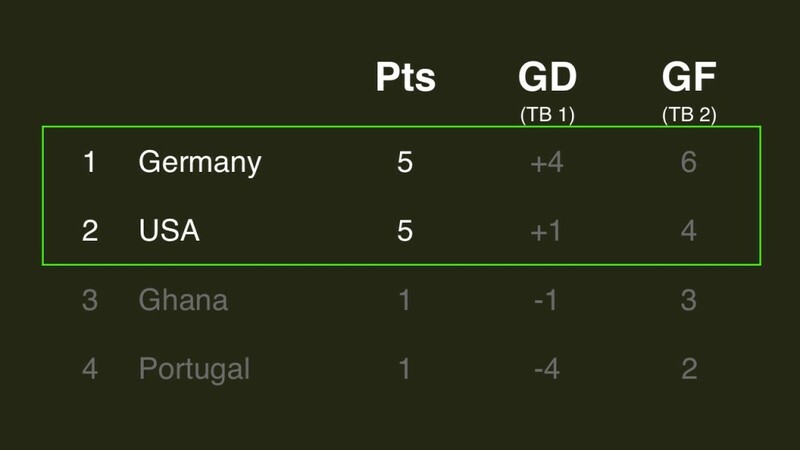 All four teams are alive in Group G, with the USA and Germany looking to hold on to their spots. They play each other Thursday at noon EDT, while Ghana and Portugal kick off at the same time. 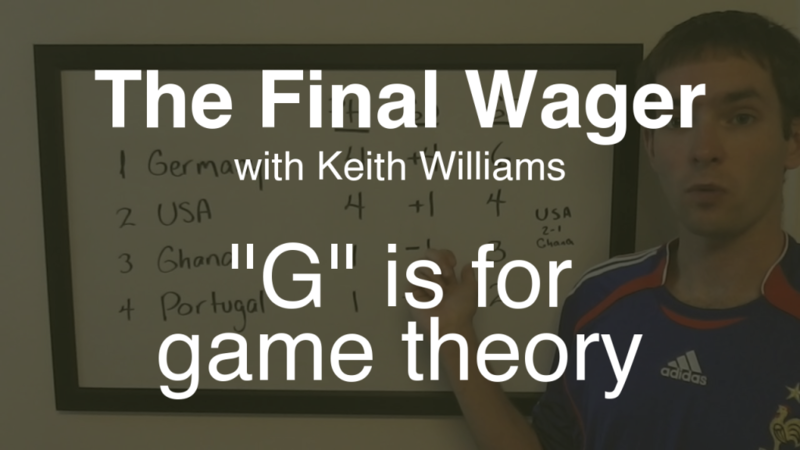 Let’s take a look at the game theory behind this situation. The top two teams will advance to the single-elimination knock-out rounds. 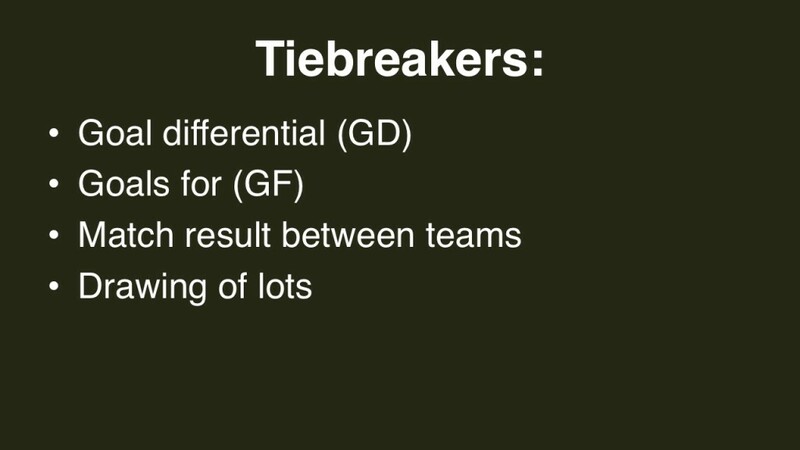 FIFA uses a series of tiebreakers to determine order should two teams finish with the same number of points. The reality is a bit trickier than that, though. In the 1982 FIFA World Cup, West Germany and Austria faced off in the final game in their group. Both teams knew that if West Germany won by 1 or 2 goals, they would both advance at the expense of Algeria, which had shocked West Germany in the opening round. After West Germany scored early in the match, neither side did much of anything for the remainder. It’s still considered one of the biggest scandals in soccer history, even though no rules were technically broken. FIFA responded by starting the final group-stage matches at the same time in subsequent Cups. Even though a draw would be just fine for the Americans, any perceived lack of effort would likely result in outrage around the world. The USA is already unpopular in several regions, and its budding soccer base could do without the bad PR. 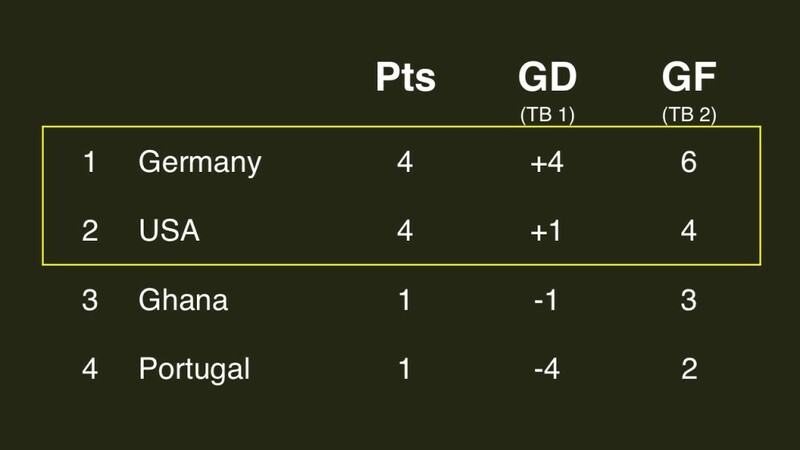 Germany looks rather secure to advance; it’d have to lose by a landslide, or Ghana would have to crush Portugal. Here are the possibilities for each team. Why didn’t I guess! Of course you would do a post on the World Cup! This kind of strategic play, sometimes called “sportsmanlike dumping”, is a frequent topic of discussion in The Bridge World magazine. Their consensus, with which I agree, is that deliberate non-effort or even deliberately losing a game is a perfectly legitimate tactic if it helps you win the larger event and the rules allow it. 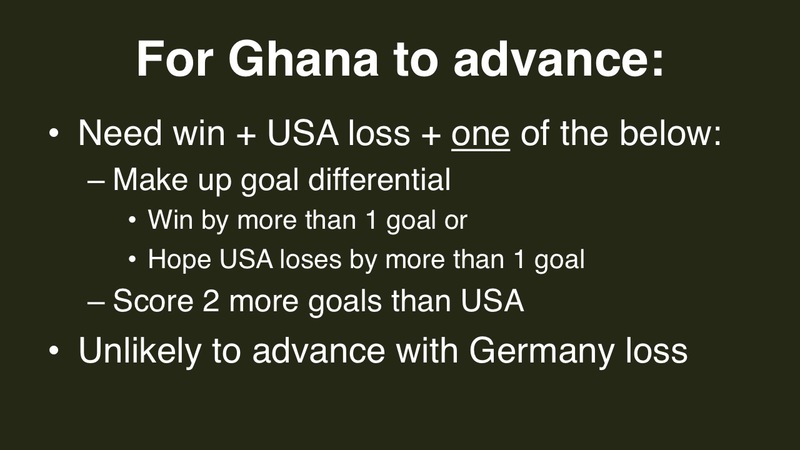 Were I the US coach, my choice of whether or not to “collude” with Germany by playing to draw would depend on whether I would rather face Germany or Ghana in the following round. 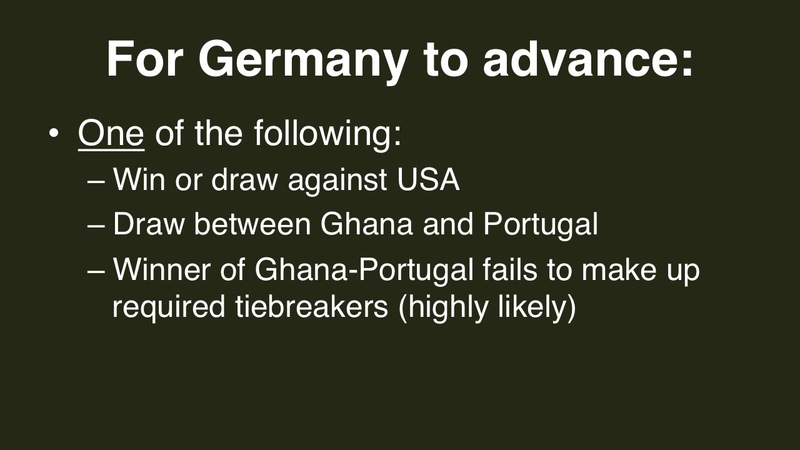 My guess is that Germany is the weaker opponent, so I would play to draw. If the fans feel gypped, then they should go to FIFA and demand the tournament scoring system be changed so it no longer rewards draws. Perhaps a draw should cease to be worth anything. 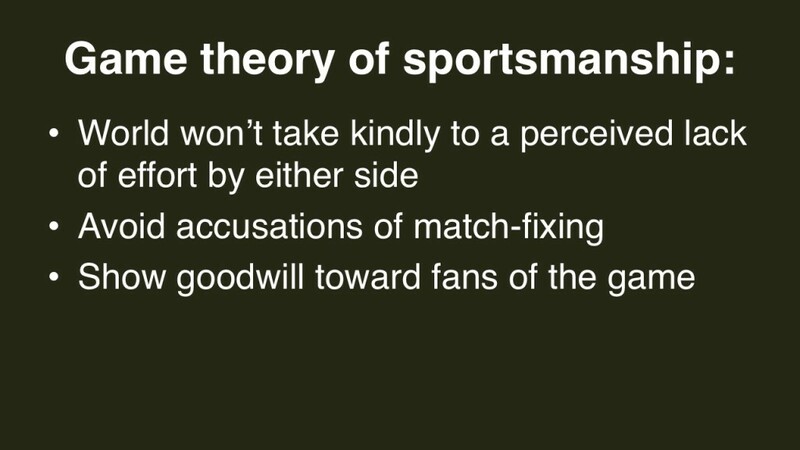 2. the players are paid large sums to perform their craft, and are expected to earn that money. The winner of Group G plays second place in Group H, and second in Group G plays the winner of Group H.